AT THE CITY CLUB OF SAN FRANCISCO! Have you always dreamt of a beautiful city backdrop for your wedding reception? Do you love art deco and world-famous art and think it would be a unique accent for your wedding? If you answered yes, then The City Club of San Francisco would be the perfect place for your wedding reception! At The City Club of San Francisco, we pride ourselves for being a one-stop wedding shop. Every detail, from tables, linens, silver, glassware, and fresh florals, and everything in between, we take care of it all. 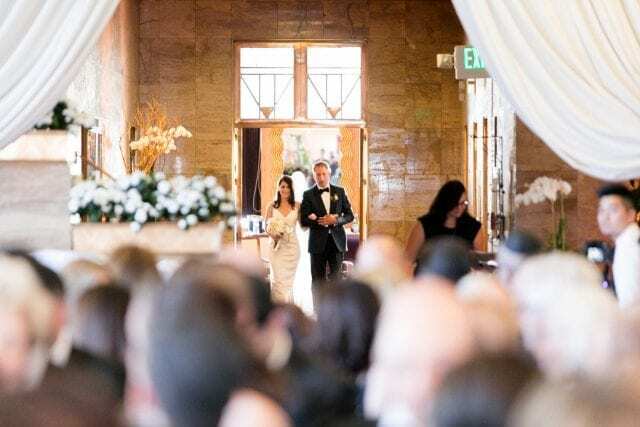 When you book your wedding reception at The City Club of San Francisco, we’ll meet with you so we know exactly what you envision for your special day. Our attention to detail and personalized wedding services are what make us stand apart from the rest. We will stay in close contact with you but you can rest assured that all the details of your wedding reception are in the hands of our talented event coordinators. We want you to focus all your energy on the moments that matter most on your wedding day. For the meal at your wedding reception, we offer catering services onsite, so you don’t have to worry about booking a caterer separately. With a focus on organically-farmed, market-fresh ingredients, our culinary team will create a memorable dining experience for your wedding day that is sure to impress even the pickiest or foodiest of your guests. We offer an array of wedding packages to choose from, or we can work with you to customize a menu that is just what you envisioned for you and your guests. Your personalized menu for your wedding reception will be as unique as you and your fiancé are. To Book Our Wedding Venue, Give Us a Call Today!